Illinois waterways are spectacular. Boating is a great way to enjoy our rivers and lakes. Lake Michigan is one of the most spectacular lakes in the world. Boaters, like other motor vehicle owners, are required by law to drive and operate their boats safely. As experienced Chicago boat accident lawyers we have represented many individuals involved in boating accidents. Most boating accidents are caused by human error of the boat operator. The person controlling the boat must be cautious and aware of safety, otherwise they pose a risk to themselves and all others on the waterways. In 2010, the main cause of boating accidents in the United States was the inattention of the boat driver. Other common causes of boating accidents include careless operation of the boat, inexperienced drivers operating the boat, driving the boat at unsafe speeds for conditions, and not maintaining a proper lookout. Experienced Chicago boat accident lawyers understand, Illinois law requires boat operators to handle their watercraft in a safe and careful manner. In fact, it is a crime in Illinois to operate a boat recklessly or negligently. In addition to criminal penalties, boat operators can be sued for negligence if their carelessness causes an accident and someone gets hurt. For example, if a boat operator drives too fast for conditions and collides with another boat or object and someone gets hurt, the injured party may be entitled to sue and collect monetary damages. Civil and criminal liability also come into play when a boat operator causes an injury while operating a boat under the influence of alcohol. Drinking and boating is very dangerous. In fact, the U.S. Coast Guard estimates that boat operators with a blood alcohol concentration above .08 are more than 10 times as likely to be killed in a boating accident than those with a blood alcohol level of zero. Additionally, boat owners should be extremely careful when they allow other people to operate their boat. Under Illinois law, if a boat owner leases or lends his boat to another person and that person causes an accident on a Illinois waterway, the boat owner may be held jointly and severally liable with the operator of the boat for any resulting damages. Although most boating accidents occur due to the boat operator's negligence or recklessness, some boating accidents are caused by a defect of the boat itself. In 2010, for example, 282 boating accidents occurred due to some type of failure of either the boat's machinery or its hull (the body of the vessel). When an injury results because of the defective or dangerous condition of a boat, the injured person may have a products liability case against the manufacturer of the boat. If you have been injured in a boating accident, you may be entitled to compensation for medical bills, vehicle repairs, pain and suffering, loss of earning, and future loss of earnings. In the event that a death has occurred as a result of the boating accident, you can file a wrongful death suit. 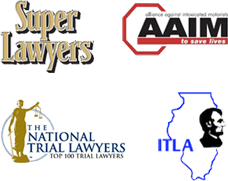 Our Illinois and Chicago boating accident attorneys are prepared to help you with the legal matters following your boating accident. The personal injury and wrongful death lawyers at Nemeroff Law Offices represent many victims who are injured or killed by the negligence of others. We will help you recover the money damages you or your family is entitled to. If you or someone you love have sustained injuries or loss from an boating accident Contact Nemeroff Law Offices today. Our experienced baoting injury accident attorneys are available to speak with you directly.